Benedict XVI now wears the Fisherman's Ring and the papal transition is complete. Centuries of ritual, with a few modern touches, saw the German pontiff installed on Sunday as the Church's 265th Pope. It was the climax of an extraordinary month in the life of the Roman Catholic Church. The death of John Paul II on 2 April was the signal for an invasion of pilgrims from Poland. 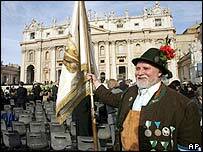 They besieged the Vatican, with their red and white flags, to pay their respects to the Polish pontiff. On Sunday it was the turn of the Germans, proudly waving their national flag and the blue and white colours of Bavaria, to pay homage to one of their own. "I am from the area the Pope is from, so I had to come," said Cornelia Lanzi, a shop assistant from Regensburg. "We slept in the sports hall of a local school last night. We are tired but we are so excited it doesn't matter." Like the Poles before them, they felt they had to be in St Peter's Square to pay homage to a pope from their own land. "I feel good about the future under our new Pope"
"I came here in a convoy of five coaches," said Sabine Kunstler, a nurse from Munich. "It took 14 hours, but it was worth it. It was important to be here to give support to our new Pope." For the 78-year-old man they had all come to applaud, today marked the end of another remarkable journey. As a boy, Joseph Ratzinger grew up in a Bavarian farming community, the son of a local policeman. As a teenager during World War II, he was forced to join the Hitler Youth, and was conscripted into an anti-aircraft battery. He deserted before the end of hostilities, and was briefly held prisoner by the Allies. After the war he completed his studies for the priesthood, rising through the Church hierarchy to become Archbishop of Munich. In 1981, he was called to Rome by John Paul II, becoming one of the most powerful figures in the Vatican. 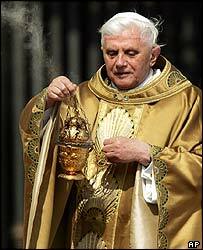 On Sunday, as Benedict XVI, he emerged from St Peter's Basilica to the cheers of a vast crowd to receive the symbols of his office. It was his first major event since his election, and while he appeared a little apprehensive at first, there was no sign of nerves by the time he got to the homily. He said he was not going to set out a programme for his papacy, but promised to listen "to the world and the will of the Lord". The Pope's words were conciliatory, suggesting he is anxious not to be seen as a divisive force, because of his conservative beliefs. The extent to which he will be a listening Pope remains to be seen, but it seems he is going to be a visible Pope, like his predecessor. At the end of the marathon service, he was driven slowly around St Peter's Square past cheering pilgrims. During the previous papacy, John Paul II made full use of his Popemobile to ensure he was seen by the faithful. The new Pope has a new set of wheels, a stylish Jeep-like vehicle, in papal white, with a fold-down windshield. It looks as if it would be good for off-road driving, but is destined to be driven at a sedate five miles per hour for the rest of its life. The Pope's rapturous reception in St Peter's Square is just a taste of what lies ahead, when he begins his travels. Just a few days after his election, we can only guess how his papacy will evolve. In 1978, none of us who witnessed the election of John Paul II had any idea of the impact he would have on the Church or the world. An earlier pope, the revered John XXIII, was expected to be little more than a caretaker, because he was 76 when elected. Yet he went on to astonish the Church with the sweeping reforms of the Second Vatican Council. Today, Benedict XVI stands at the threshold of the papacy. The Church is still wondering where the shepherd will lead his flock.